able to make mathematical sense of it? Jean-Pierre Changeux, an internationally renowned neurobiologist, and Alain Connes, one of the most eminent living mathematicians, find themselves deeply divided by these questions. 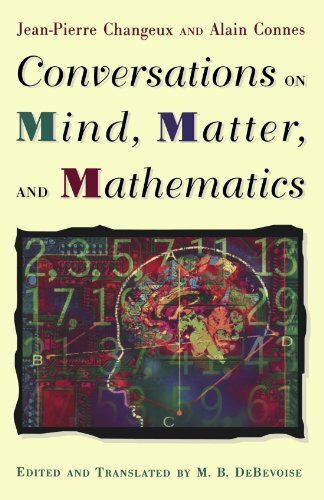 The problematic status of mathematical objects leads Changeux and Connes to the organization and function of the brain, the ways in which its embryonic and post-natal development influences the unfolding of mathematical reasoning and other kinds of thinking, and whether human intelligence can be simulated, modeled,--or actually reproduced-- by mechanical means. The two men go on to pose ethical questions, inquiring into the natural foundations of morality and the possibility that it may have a neural basis underlying its social manifestations. This vivid record of profound disagreement and, at the same time, sincere search for mutual understanding, follows in the tradition of Poincareacute;, Hadamard, and von Neumann in probing the limits of human experience and intellectual possibility. Why order should exist in the world at all, and why it should be comprehensible to human beings, is the question that lies at the heart of these remarkable dialogues. Caterina Consani is a professor in the Department of Mathematics at Johns Hopkins University. Alain Connes is a professor at the College de France, Institut des Hautes Etudes Scientifiques in Bures sur Yvette, and a distinguished professor in the Department of Mathematics at Vanderbilt University. He won the Fields Medal in 1982.